It's All Connected: Make The Ordinary Something Extraordinary! If you been following along with me, you'll know I am working less and living more. At the same time, I am restyling my home and grounds. I've been self employed most of my adult life and I have discovered that not working equals not getting paid. There are no sick days or vacation days. You can, of course, be sick or on holiday as much as you like but you will not get paid and you will have to catch your work up yourself. This throws a teeny, weeny bit of a wrench in the financing of my home projects. Hence, I have adopted a policy of thrift, gift, reworked and found for the non structural elements. A lot of paint, some sewing and a wee bit of crafting can transform budget friendly items into pretty accents. Since I'm still obsessed with transferring images, I picked an idea up from several sites to try it on wood and clay objects. I found a great tutorial on Heaven's Walk for decorating clay pots. You could transfer directly onto the pot. I wanted mine to look old and weathered so I used gray and white craft paint, a sea sponge and paintbrush to layer on colour. I dry brushed over the entire surface to mellow it all out. To dry brush, dip your brush in the paint and then wipe it all off on a piece of newspaper. When you think there is nothing left to paint with, it's just right for dry brushing! Brush over the entire pot until the surface looks dull and aged. Let the paint dry. Eventually, this pot will hold a topiary on my kitchen window sill and I chose an image of an old, French chocolate ad from The Graphics Fairy. You need to invert the image when you print it so the words read 'right side up' after the transfer. (the words don't actually say 'right side up', just look 'right side up'!) You can print on inkjet or laser for this project and can do colour as well. I cut around the image to reduce the amount of excess paper and applied Mod Podge to the ink side with a brush. I used outdoor because that is what I had at hand. If the pot is only being used indoors, it doesn't matter which kind you use. Carefully position the image on the pot. 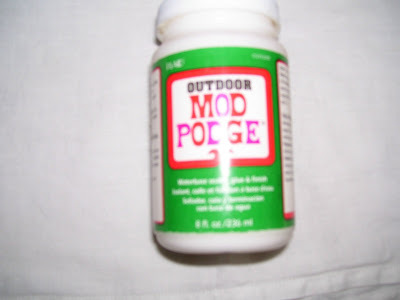 The Mod Podge glues it in place. Smooth out any air bubbles and let it set for a good twelve hours. I left mine overnight. In the morning, I got the paper quite wet with a sponge and starting rolling it back, from an outer edge, with my thumb. This is kind of hard to do while you are trying to take a picture with your other hand! The bottom layer of paper is glued on to the pot with the Mod Podge and won't come off unless you rub it too hard. I did that with the edges of the gray shaded areas to make it look like a label that was peeling but be careful if you don't want that effect. 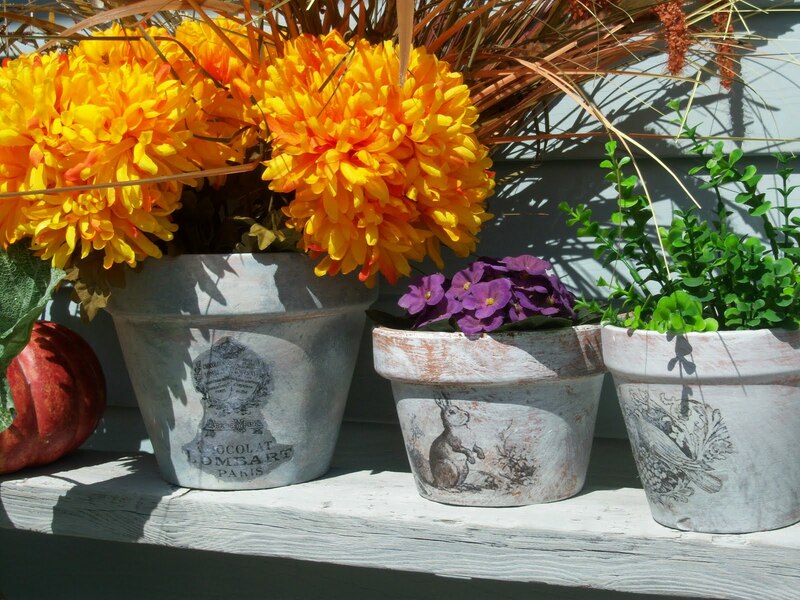 If you are using your pot outside, I'd recommend you use a spray sealer to waterproof it. These three clay pots are done with the same technique and I think they look extraordinary! Think I like the bunny one the best. Thanks! I like the bunny best too. The possibilities are endless.